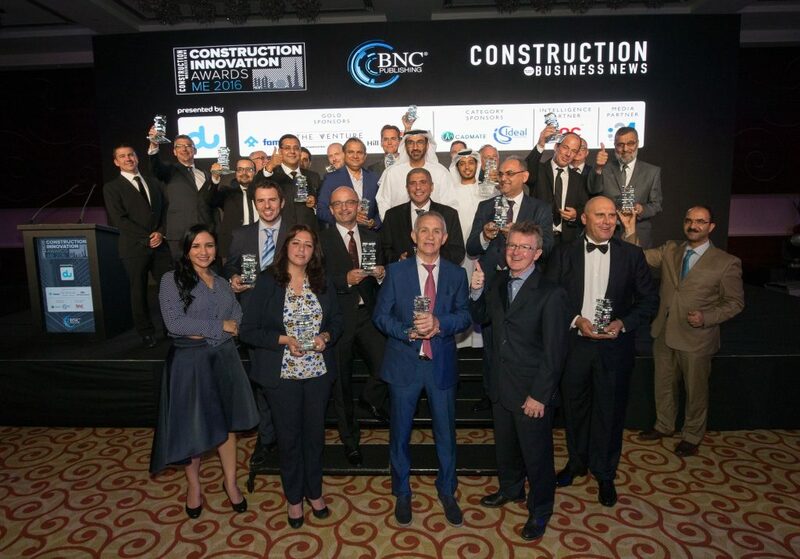 The winners of the Construction Innovation Awards 2016, presented by Du, were crowned on 19 October at a glamorous ceremony at Westin Mina Seyahi, with 300 construction industry professionals in attendance . Twenty-three winners took home prestigious Construction Innovation Awards, with H.E. Hesham Abdulla Al Qassim, chief executive officer, Wasl Asset Management Group scooping the coveted Lifetime Achievement Award for his special contribution to Dubai’s built landscape over the past decade. The award for Fastest Growing Company went to KBW investments, while Kimmco earned the Innovation of the Year award for CLIMAVER, a lightweight pre-insulated ductwork system. Arcadis was victorious in two categories as winner of Health and Safety Initiative of the Year, and with Arcadis associate director, May Faraj, walking away with the Engineer of the Year Award. Hospitality Project of the Year was awarded to The Palm Tower by Nakheel, a 52-storey hotel and residential complex comprising 504 luxury residences and a five-star 289-room St. Regis. Meanwhile, Dubai South claimed the Master Developer of the Year for its 145km2 master-planned city with a future population of 1 million, the world’s largest airport in the making – the Al Maktoum International Airport – and the site of World Expo 2020. China State Construction Engineering Corporation M.E. The Construction Innovation Awards were presented by DU, with support from Gold Allies, Hill International, FAMCO, and The Venture, in addition to Category Sponsors Ideal Standard and Cadmate, and Intelligence Partner, BNC Intelligence.